Jake is 7 and a big-time reader. Like, insatiable. We can't keep him in books. That means that he's kind of an advanced speller, too, at least for 2nd grade. 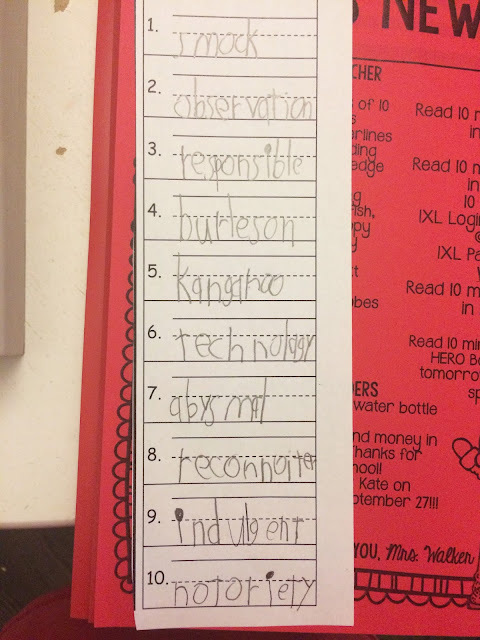 So his teacher asked if it would be okay to let him choose his own spelling words each week, words that he doesn't already know how to spell, so that he can really learn some new words this year. On top of learning how to spell them, he's also responsible for learning their definitions and being able to use them correctly in a sentence. Suffice to say, Jake's basically spelling on my level now. Ha! And math? Well, in math he's far beyond me. Last night, his teacher sent me a text about a math quiz of his that she was grading. "So there is a pretest/post test I have to give with this one question I hate, because I can't decide if it's right or wrong. This is Jake's response. Dying!!!" Not sure how I feel about him editorializing on his quizzes. Cute or impertinent? THIS time Ima go with "cute."